Chinese Economy Sputtering, Where Did the Trade Surplus Go? It was tempting to believe that China was different. With its command and control economy with some of the trappings of free market capitalism, trillions in reserves, and abundant natural resources, many thought that China would "decouple" from the Western world's problems and sail into a prosperous future. However, despite its long history, exotic names and seemingly strong position, China cannot avoid the rules of economics which have applied to all countries throughout history. Corruption and the failure to follow the rule of law is one of the main factors which has dragged down the American economy. The fact that - according to the Chinese central bank - Chinese officials stole $120 billion and fled the country does not auger well for China. Scandals among various Chinese companies are not helping, either. China's money-market rate climbed to the highest level in more than three years as a worsening cash crunch prompted the central bank to suspend a bill sale. The seven-day repurchase rate, which measures interbank funding availability, has more than doubled since June 14, when the People’s Bank of China ordered lenders to set aside more money as reserves for a sixth time this year. The central bank suspended a sale of bills tomorrow, according to a statement on its website today. Since 1966, each dollar of additional debt has given the economy less of a boost. In 1966, $1 dollar of debt boosted GDP by $.93. But by 2007, $1 dollar of debt lifted GDP by less than $.20. What is this chart? Why, the history of our idiocy. It's quite simple; this is the multiple that each dollar of debt (anywhere in the economy) has returned in GDP looked at on a quarter-on-quarter basis, net of the debt increase itself. That is, if the multiple is "1" then for each dollar of debt added to the economy there was one dollar of output in the form of GDP added as well during the same period of time. If it's "0" then the debt itself produced no additional output, but did fund itself. If it's negative, well, into the black hole you go. Since this is a quarterly number it's quite noisy but there's no mistaking what it tells you. If you pay attention you'll note that since 1980 this has never been positive - not even for one quarter - and it was only rarely positive before that time! Dwight Perkins of Harvard argued at the China Development Forum that the “incremental capital output ratio” – the amount of capital needed for an extra unit of GDP – rose from 3.7 to one in the 1990s to 4.25 to one in the 2000s. This also suggests that returns have been falling at the margin. 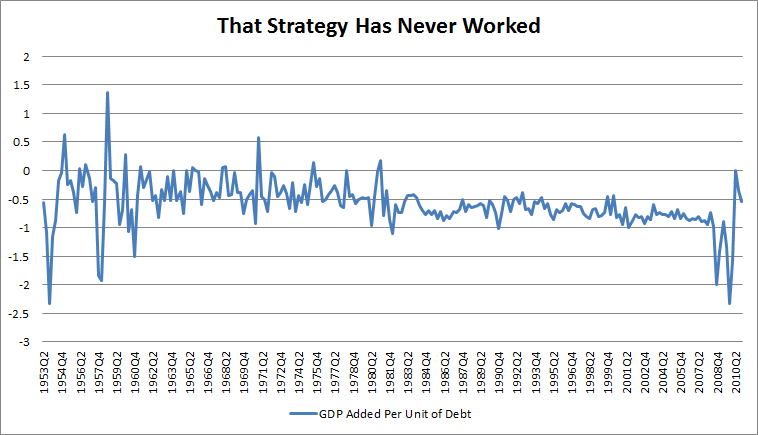 The thesis advanced by Prof Pettis is that a forced investment strategy will normally end with such a bump. The question is when. In China, it might be earlier in the growth process than in Japan because investment is so high. Much of the investment now undertaken would be unprofitable without the artificial support provided, he argues. One indicator, he suggests, is rapid growth of credit. George Magnus of UBS also noted in the FT of May 3 2011 that the credit-intensity of Chinese growth has increased sharply. This, too, is reminiscent of Japan as late as the 1980s, when the attempt to sustain growth in investment-led domestic demand led to a ruinous credit expansion. As growth slows, the demand for investment is sure to shrink. At growth of 7 per cent, the needed rate of investment could fall by up to 15 per cent of GDP. But the attempt to shift income to households could force a yet bigger decline. From being an growth engine, investment could become a source of stagnation. And if you think that bailouts as an attempt at stimulus are solely a Western game, think again. China is bailing out local governments, giving cash for clunkers, and trying just about every possible type of bailout. Consumer frugality is obviously slowing the American economy. But the Chinese consumers are picking up the slack, right? One of the top experts on China's economy - Michael Pettis - has a[n] essayarguing that China is blowing a giant credit bubble to avoid the global downturn. Except for the exotic names ... and the spice-bearing ships, this story has a remarkably contemporary ring to it, as do nearly all historical accounts of financial crisis, by the way. This story is not totally relevant to China today except to the extent that it indicates how difficult it is for banking systems flush with cash to avoid speculative lending, and how the very fact of their speculative lending then creates the conditions that can bring the whole thing crashing down. Hyman Minsky told us all about this kind of thing. There has never been a political or economic system in history that has been able to avoid the consequences of excessive liquidity within the banking system. Even the Romans learned this, and they learned it the hard way, as we always do. America's easy credit bubble started in 2001. Rome's prior to 10 BC. We know the results of both. Is China now blowing a huge credit bubble which will lead to a giant crash down the line? Pettis thinks so, and every Austrian economist in the world would agree. Both China and America are addressing bubbles by creating more bubbles and we’re just taking advantage of that. China's official daily newspaper - China Daily - writes that China will probably run a trade DEFICIT in March ... It shows that the entire environment everyone assumes we are operating in - China as the giant net exporter with huge trade surpluses - might not continue for much longer. In other words, "Chimerica" is starting to break up. And those huge Chinese purchase of U.S. treasuries are no longer guaranteed. 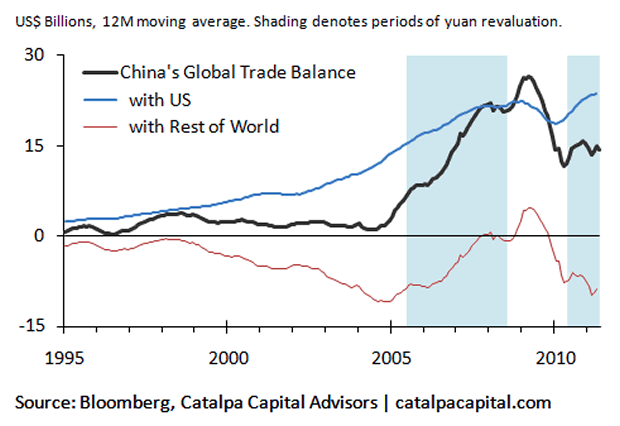 After hitting record highs in 2009, China’s global trade balance is well below where it used to be and ticked up only modestly in the latest data. However, the headline number can be misleading: the trade surplus with the US continues to hit new highs while China is running massive trade deficits with the rest of the world. *** When all the math is done, without the US, China is running a trade deficit with the rest of the world (the red line). *** The renewed strengthening of the yuan against the dollar, however, has lagged the global surge in commodity prices. Because China is paying more for its commodity imports, the deficit with its non-US trade partners continues to grow. China has been buying US Treasuries for many years to finance its trade surplus with the US. China may need to continue doing so for some time to come to offset its trade deficit with the world ex-US and keep its overall trade balance stable. On the surface, China presents a fiscal study in contrast with the United States, keeping a remarkably low ceiling on debt even as it spends its way out of the financial crisis. The trouble is that excludes local government borrowing, the current surge in loans backstopped by Beijing and bad assets cleared from the banking system but still floating about. When all are thrown into the pot, analysts estimate that China's debt may be closer to 60% of GDP, putting it in virtually the same league as the United States, which was at 70% at the end of 2008 before it launched its massive economic stimulus program. But China's finances are deteriorating more quickly than the government expected, fueling a rise in the stock of both explicit and disguised debt that will constrict its wriggle room. Above and beyond that are 400 billion yuan in bad loans in banks' hands and at least 1 trillion yuan in non-performing debt hived off their books and assigned to asset management companies. The buck stops with Beijing on all of these. The record surge in bank lending this year means that its sum of liabilities is about to swell in size. China's economy is teetering on the edge of a major slowdown ... according to a noted China strategist. David Roche, an economic and political analyst who manages the Hong Kong-based hedge fund Independent Strategy, says the world's third-largest economy is now on the brink, faced with the inevitable reckoning that follows an extended bank-lending binge. "We've got the beginnings of a credit-bubble collapse in China," said Roche, predicting the economy will likely cool from its stellar double-digit growth rate to a 6% annual expansion as a result. As Northwestern University's Victor Shih points out, the Chinese government will slowly reveal more and more of the true ratio of bad loans to good loans, and raise its figures for local government debt. Shih says that recapitalizing Chinese banks to cover losses for the bad loans will eat up more and more of China's reserves. China's chief auditor has warned that high levels of local government debt could derail the country's economy, with some observers suggesting that a number of Chinese provinces are even more fiscally-troubled than Greece.